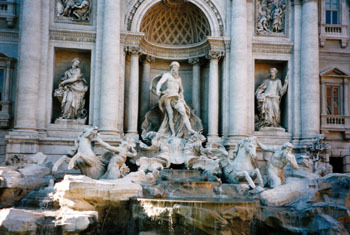 Tammay and I travelled to Italy on the 6th June 1998. 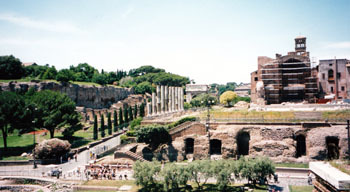 We flew from London Stanstead to Rome Ciampino. 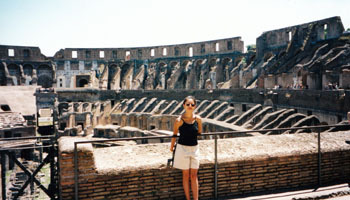 We met up with Gabby Reeves (a fellow UCL student) who had been living in Campobasso while teaching English in a foreign language. 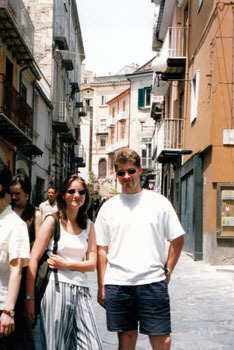 Gabby and I in Campobasso. 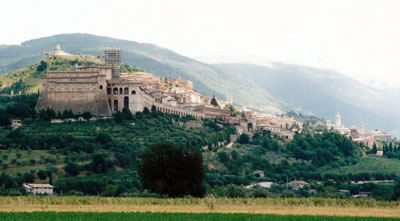 While on our way to Campitello we stopped for a picnic in the mountains. 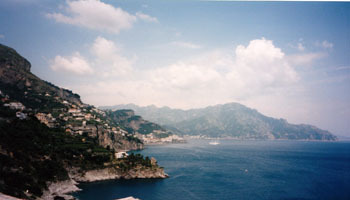 We drove along the winding roads of the Amalfi Coast. 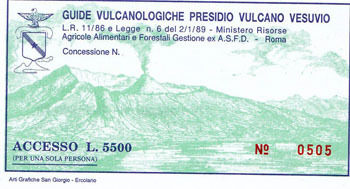 This is a view between Solerno and Sorrento. Gabby seems to be getting quite excited about our progress. A sharp turn into this rest stop left Gabby upside down in the footwell! 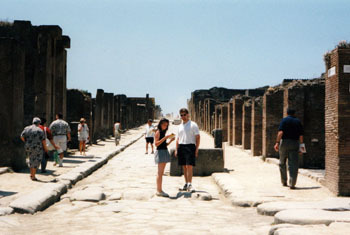 Tammay and Gabby in Pompeii. 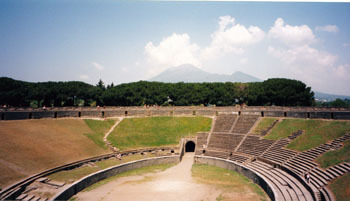 The amphitheatre in Pompeii with a view on Mount Vesuvius in the background. 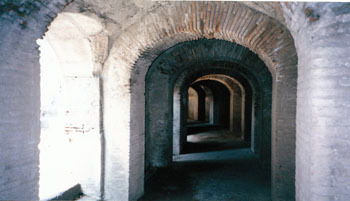 One of the tunnels under Pompeii's amphitheatre. 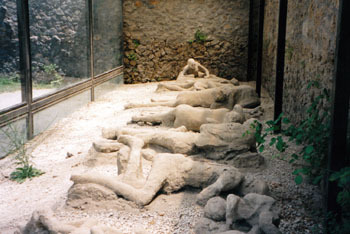 Some of the victims of the AD79 erruption of Vesuvius that devastated Pompeii. 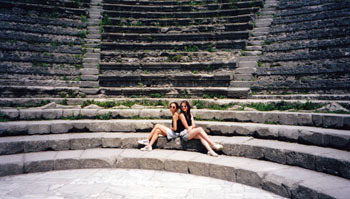 Gabby and I in the baking heat. 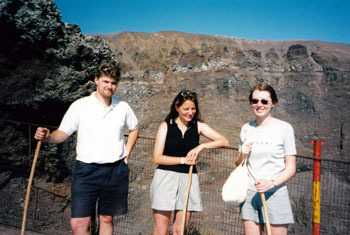 Ready for a walk to the top of the volcano. Gabby, Michelle and I at the top. As we approached the top, we joked that there would probably be a toll booth charging people to reach the sumit. Sure enough as we came aroind the last turn there it was! 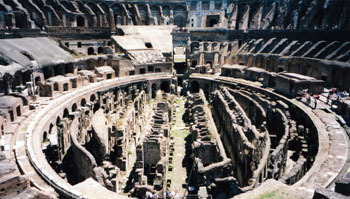 I wonder how many people fail to take enough money to get in? 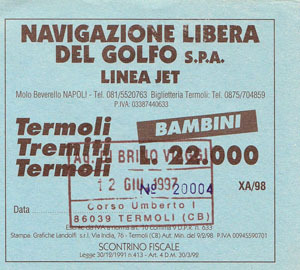 Our boat tickets to the Tremiti islands. 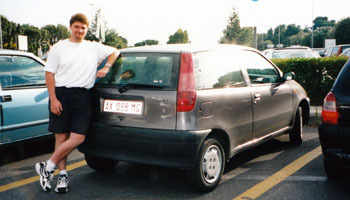 It was a long drive from Campobasso to the port – a seemingly endless string of hairpin bends. 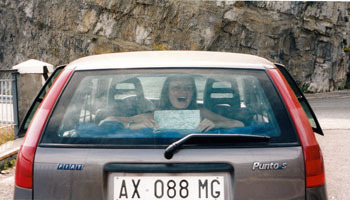 We were racing to get to the port in time for our boat and Gabby was starting to feel a little unwell – "how many more bends???". 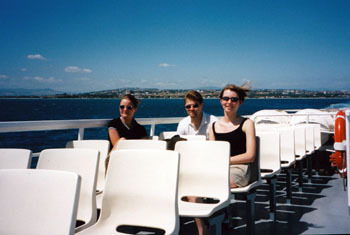 Michelle, Gabby and I on the boat to Tremiti. 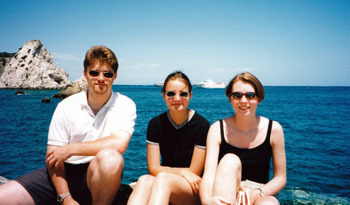 Michelle, Gabby and I having lunch on the harbour wall. 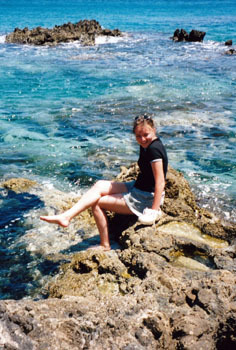 Gabby getting her feet wet in the beautifully clear blue water. Tammay and I left Gabby and Michelle and travelled North. 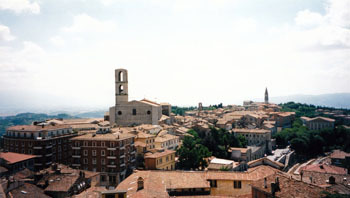 One of our stops was the town of Perugia. We parked our car outside the old town in a spot we believed to be free - upon our return we were greeted with a parking ticket. Tammay made her way to the police station and happened to meet the Mayor. After each speaking a few words the other didn't understand, the Mayor took the ticket and ripped it up! Sometimes it's good to be the ignorant Johnny Foreigner! 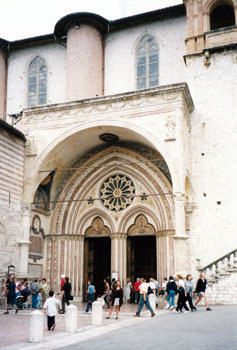 Tammay in front of the main entrance of the St. Francis Basilica in Assisi. 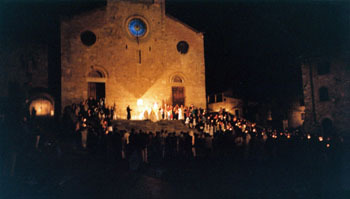 We thought someone was about to be sacrificed but it turned out to be the Corpus Christi Festival. 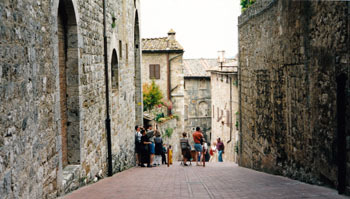 This was our very first visit to San Gimignano and just as Robert had predicted, Tammay and I loved it. 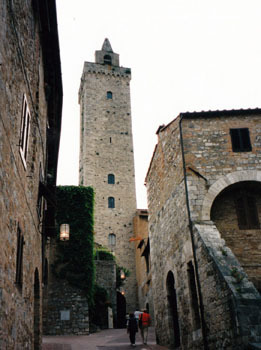 The town is filled with these tall stone towers. 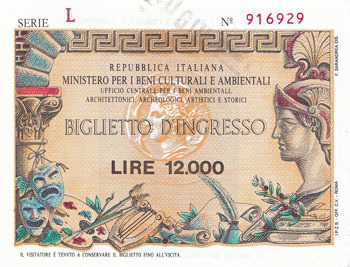 This is a view of the tallest. 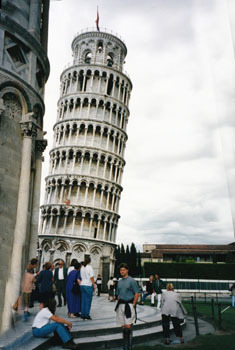 We took a day trip to Pisa to see the Leaning Tower. 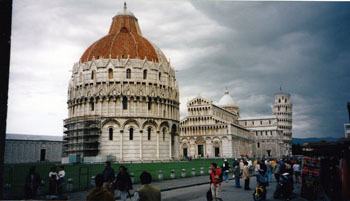 This is the "Field of Miracles" - Dome, Basilica & Leaning Tower of Pisa. Me and the Leaning Tower of Pisa. 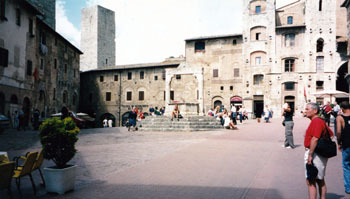 Tammay at the well in the main square of San Gimignano. 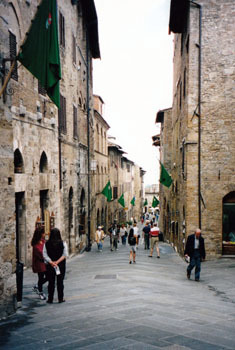 Tammay (just) and the streets of San Gimignano. 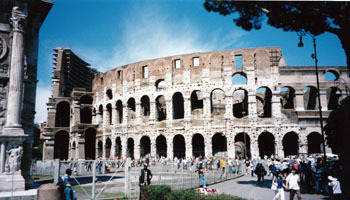 Following our tour of Tuscany we drove back to Rome where we returned our car to the airport. Me in St. Peter's Square in front of St. Peter's Basilica. 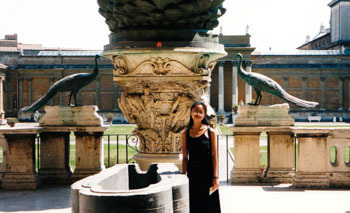 Tammay in the Vatican Museum. 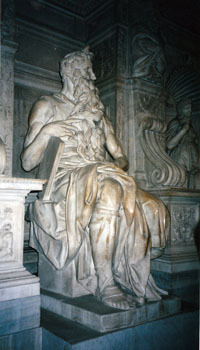 Michelangelo's Moses in St. Peter in Chains. 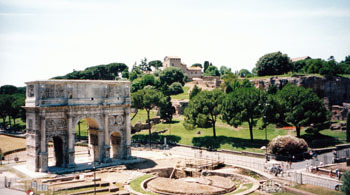 The arch next to The Colleseum. 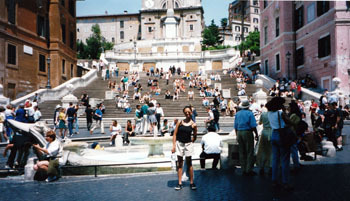 Tammay at The Spanish Steps. 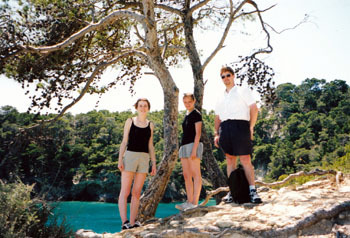 We returned to London on the 20th June 1998.